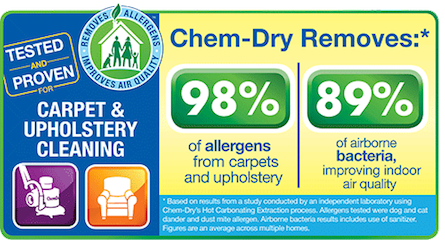 Chem-Dry of La Crosse offers professional carpet cleaning and upholstery cleaning in La Crosse & Onalaska. Instead of steam cleaning or shampooing, we use the cleaning power of carbonation to penetrate deep into the fabric of your carpet and upholstery and push dirt and allergens to the surface where we can extract it. This process uses 80% less water than traditional steam cleaning, allowing your carpet to dry in 1-2 hours instead of 1-2 days. Wet carpets foster the growth of mold and mildew, causing a musty smell and poor air quality, but with Chem-Dry of La Crosse you don't have to worry. Many carpet cleaning solutions use soaps and detergents which leave a sticky, dirt-attracting film, making it more difficult to keep you carpets clean. Chem-Dry's patented carpet cleaning solution, The Natural, uses carbonation instead of detergents, so no sticky residue is left over. The Natural is green-certified and 100% non-toxic, containing only products found on the FDA's G.R.A.S. (generally recognized as safe) list. 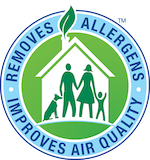 When Chem-Dry of La Crosse cleans your home, you can trust that our proprietary process combined with our non-toxic, green-certified solution will leave your home not only cleaner but safer and healthier, too. Our professionally-trained technicians here at Chem-Dry of La Crosse are dedicated to providing an outstanding cleaning experience and will treat your home and family with the respect you deserve. Trust the home health experts at Chem-Dry of La Crosse. Click below to access our form and provide us with your contact information and any other information about your needs. We'll contact you soon to schedule an in-home appointment so you'll be on your way to a cleaner, healthier home! Looking for a professional carpet cleaner to give a real carpet cleaning ...not just charging you for a blow and go, rinse and soak??? Look no further, these are your guys!!! True pros who take pride in what they do. Professional Carpet Cleaning & Upholstery Cleaning in La Crosse, Onalaska, & Winona.